1931-1935 Ford attends the University of Michigan and graduates with a B.A. in Economics. He joins the Delta Kappa Epsilon fraternity and is a member of Michigamua, an esteeemed senior honor society. 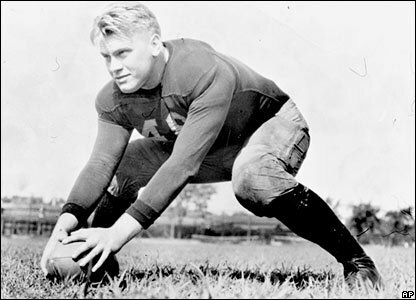 Ford also plays center on the football team, earns three varsity letters, is named Most Valuable Player on the 1934 team, and plays in the East-West Shrine Game and the College All-Star Game. Ford receives professional football contract offers from the Green Bay Packers and the DEtroit Lions, which he declines. Ford was involved in The Boy Scouts of America, and attained that program's highest rank, Eagle Scout. In subsequent years, Ford received the Distinguished Eagle Scout Award in May 1970 and Silver Buffalo Award from the Boy Scouts of America. He is the only US president who was an Eagle Scout. Scouting was so important to Ford that his family asked that Scouts participate in his funeral. About 400 Eagle Scouts were part of the funeral procession, where they formed an honor guard as the casket went by in front of the museum. A few selected scouts served as ushers inside the National Cathedral. 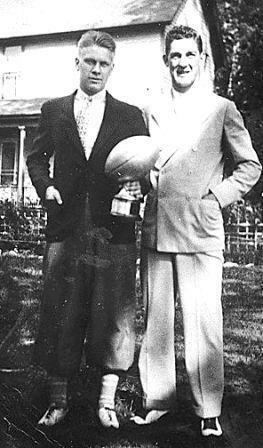 During the same season, in a game against the University of Chicago, Ford “became the only future U.S. president to tackle a future Heisman Trophy winner when he brought down running back Jay Berwanger, who would win the first Heisman the following year.” In 1934 Gerald Ford was selected for the Eastern Team on the Shriner’s East West Crippled Children game at San Francisco (a benefit for crippled children), played on January 1, 1935. As part of the 1935 Collegiate All-Star football team, Ford played against the Chicago Bears in an exhibition game at Soldier Field. The University of Michigan retired Ford's #48 jersey in 1994. At University of Michigan, Ford became a member of the Delta Kappa Epsilon fraternity (Omicron chapter) and washed dishes at his fraternity house to earn money for college expenses. Following his graduation in 1935 with a Bachelor of Arts degree in economics, he turned down contract offers from the Detroit Lions and Green Bay Packers of the National Football League to take a coaching position at Yale and apply to its law school. Ford continued to contribute to football and boxing, accepting an assistant coaching job for both at Yale in September 1935. At University of Michigan, Ford became a member of the Delta Kappa Epsilon fraternity (Omicron chapter) and washed dishes at his fraternity house to earn money for college expenses. Following his graduation in 1935 with a Bachelor of Arts degree in economics, he turned down contract offers from the Detroit Lions and Green Bay Packers of the National Football League to take a coaching position at Yale and apply to its law school.